Our custom fabric flowers are made using die cutters and molds. Style options include Carnation Lapels, Camellia Brooches, Roses, Daisies, Orchids and almost anything else you can think of! Once the petals are cut we emboss them, often using rare flower molds that are over 100 years old. We are able to die cut and mold different petal shapes in the fabric you want. We also assemble entire flowers—we can make anything floral related, from petals, leaves, buds, garlands, to clusters and more. We are happy to help in any part of your production process, including finishing, embellishing and packaging your accessories. 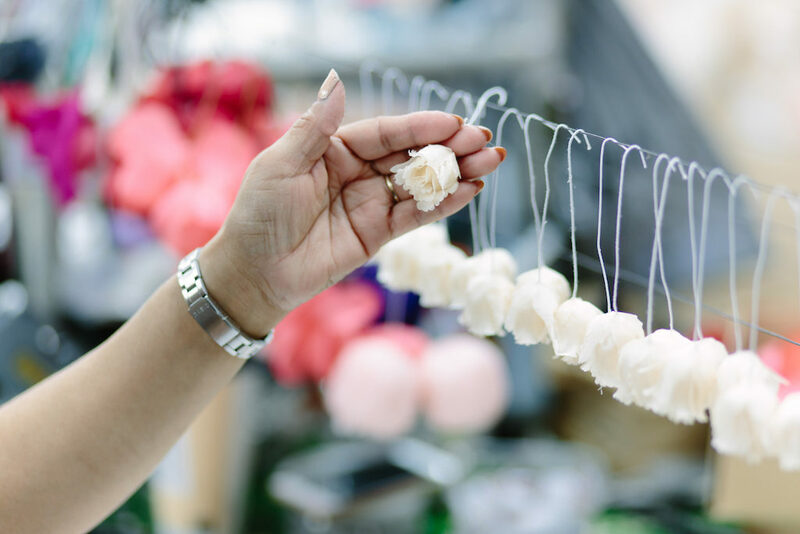 The fabric flowers we make could be assembled with hair clips, bar pins, military tacks, push pins, lapel buttons, stick pins, combs, alligator clips, shoe clips, magnets, or elongated stems. We could also add stamens and seeds to the flowers. Flowers that are put together on a stem or wire could be elongated for a vase or other custom design. In-house trimming is available, so we could add Swarovski crystals, grommet or studs to finish your designs. Contact us with any questions or visit our retail storefront here!